Carol of Rexona-AdeS Rio de Janeiro has been named on the Dream Team for a second time. 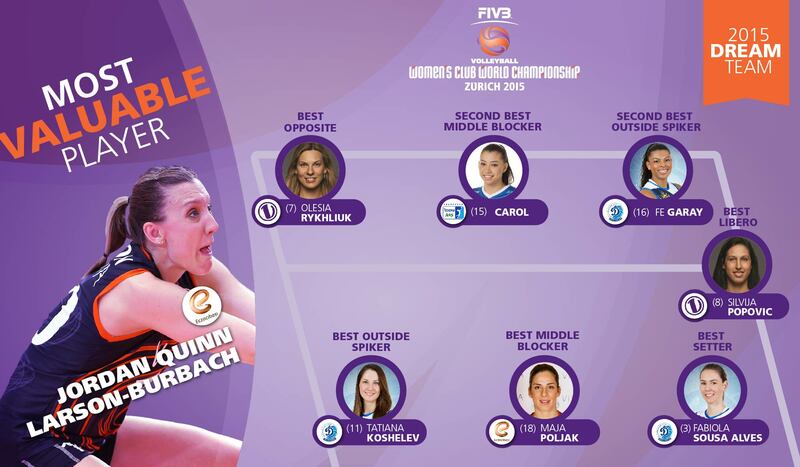 Zurich, Switzerland, May 11, 2015 - Not only do we have a brand new world champion in Eczacibasi VitrA Istanbul, but we also have a new Dream Team 2015, composed of the best players at the 2015 FIVB Volleyball Club World Championship. USA's Jordan Larson-Burbach, outside hitter for Eczacibasi was the latest in a string of Most Valuable Players going back to the very first edition of the event, in 1991. There is no player to have won the award twice. The 2015 Dream Team, however, does include two returning stars. Both are Brazilian, but one plays in Russia. Rexona-AdeS Rio de Janeiro's Carol was a best blocker in the 2013 team and she's reclaimed the post again at Zurich 2015. And Dinamo Krasnodar's Fabiola has been named best setter of the competition for the second time running. She was playing for Molico Osasco last year, losing in the final as she did this year. Joining Carol in the middle blocking position at Zurich 2015 is Maja Poljak of Eczacibasi, who scored an average of 1.19 stuffs per set. Poljak and Carol (at 1.07) are the only two blockers to average over the one point mark per set. Dinamo Krasnodar provided both the outside hitters for this year's Dream Team, with Fe Garay and Tatiana Kosheleva earning the spots. In attack, Kosheleva had 74/180 for 41.11%. Fe Garay had 50 kills in 127 attempts for 39.36%, but also contributed greatly to her team's receiving. Best opposite of Zurich 2015 was Volero's Olesia Rykhliuk, who was top scorer of the tournamet at 93 points, breaking the previous record of 85 held by Ekaterina Gamova of Dinamo Kazan since 2014. From the era before the introduction of the running score system, USA's Keba Phipps, playing for Italy's Parmalat Matera, still holds the record of 99 points plus sideouts. Volero's libero, Silvija Popovic, from Serbia, rounds up the Dream Team 2015. Popovic was top digger and third-best receiver of Zurich 2015. Full statistics of the 2015 FIVB Volleyball Women's Club World Championship are available here.